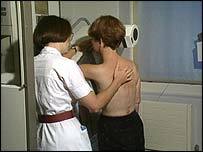 About 10,000 women are now caught in a backlog for breast screening in the Northern Health Board area, the BBC has learned. The board said it was currently running 13 months behind schedule. It comes after a consultant radiologist who worked at three NI hospitals was suspended over concerns about his "clinical judgements". A review of hospital procedures and an investigation into his work was launched last year. Thousands of cases in which the consultant was involved - at Antrim Area, Belfast City and Altnagelvin hospitals - are being reviewed. Last week, it emerged that 19 women who were patients at Antrim Area Hospital had breast cancer which went undiagnosed - despite screening. The Northern Health and Social Services Board responded to its breast screening problem by suspending the service completely. Now some 10,000 women aged between 50 and 64 who live in the board area have not had breast cancer checks that should be routine. One County Antrim GP, Brian Dunn, said the suspension and inevitable delays meant some women would have undiagnosed breast cancer. The Northern Board has admitted at least 10,000 women have not yet been invited for mammograms, and the figure is set to rise. There is presently a national shortage of radiographers and the board was already under pressure when it suspended its service last year. In a statement, the Northern Board said two new breast radiologists had been appointed and it expected to have three radiologists in place by the end of the summer. It said it hoped to reintroduce the breast screening programme in August.